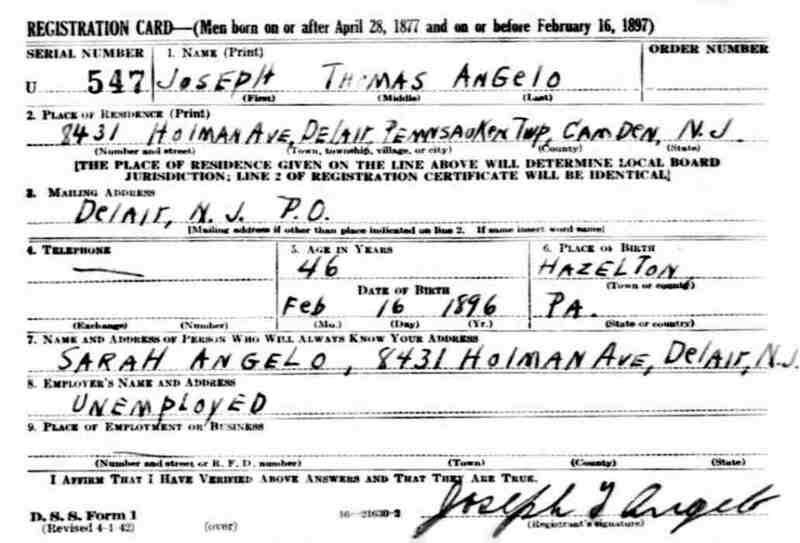 PRIVATE JOSEPH T. ANGELO was born on February 16, 1896 in Lattimer, Pennsylvania, a small town approximately 1 mile northeast of Hazleton. As of this writing little is known of his early years. The town was originally known as Lattimer Mines. The family first appears in Camden City Directories in 1904, at 636 North Front Street in North Camden. By 1908 the family had moved to 4 Fogarty Avenue, and by the time the 1910 Directory was compiled they had move to 1 Fogarty Avenue, where they stayed into 1912 before moving to 2230 Carman Street in East Camden. The 1914 Directory shows a move to 2310 Carman Street and while the 1915 Directory shows a move to 2410 Carman Street, it is likely that this was a typing error and the family was still at 2310. Anthony Angelo and family do not appear in Camden Directories again until 1920, where they are listed at 2310 Carman Street. 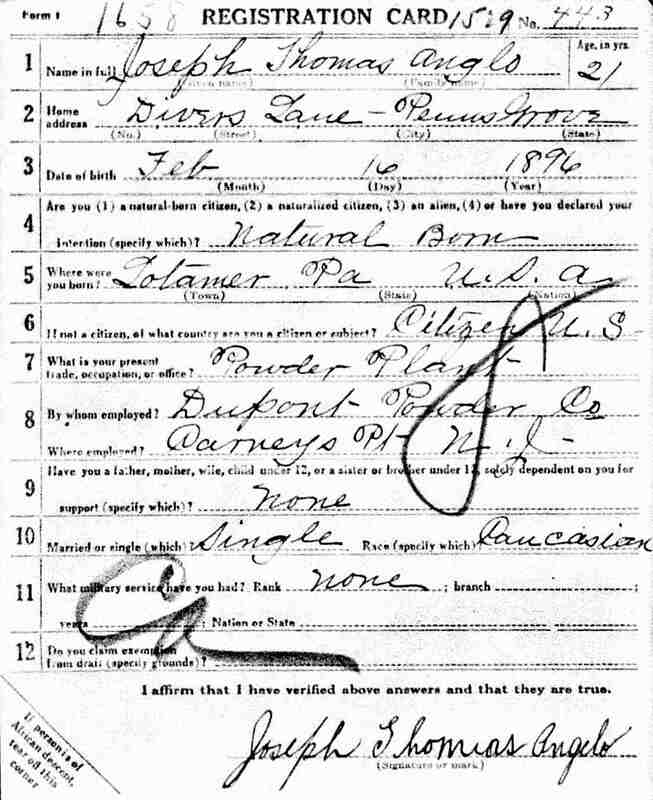 By June of 1917 Joseph T. Angelo had relocated to Penns Grove, New Jersey and was working at the nearby DuPont gunpowder plant at Carney's Point. He either enlisted or was drafted into the United States Army, and once overseas was assigned to the medical detachment of the 304th Tank Brigade. The brigade was commanded by Colonel George S. Patton Jr., who would go on to great fame during World War II. 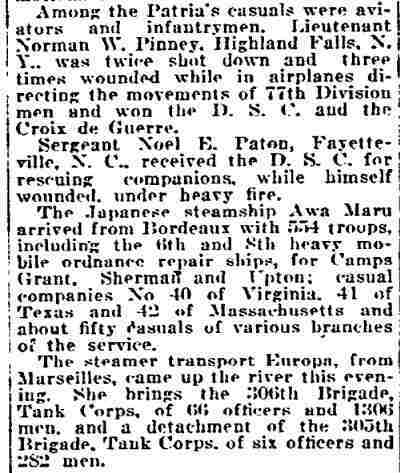 Joseph T. Angelo was awarded the Distinguished Service Cross for his actions during the Meuse-Argonne offensive on September 26, 1918, while serving as Colonel Patton's orderly. During the battle, Patton was seriously wounded by a machine gun in an exposed position. Showing great courage under enemy fire, Angelo dragged Patton to safety. He had thus saved the life of the man who would one day become a legend. "We went over the top at 6:30 in the morning. We had 150 tanks on the move and were plowing through a dense fog. As I was the Colonel’s orderly I accompanied him in the advance. We had fifteen men and two first lieutenants in our party. The tanks followed us. I was walking by the side of the Colonel, but when we came to a crossroad the Colonel told me to remain there and be on the watch for Germans. While I was on duty two American Doughboys came along. I asked them what what [sic–their] mission was they replied that they were ‘just mopping up.’ ‘Well,’ I said, ‘if you don’t get out of here you will get mopped up, as the Germans are pouring plenty of lead our way.’ When several high explosive shells burst the Doughboys took refuge in a shack. A moment later a shell hit the shack. The Doughboys were blown to atoms. A moment later I saw two German machine gunners from behind a bush and they fired on me. I returned the fire and killed one; the other one beat it. The Colonel, who was ahead of me, appeared on top of a knoll and shouted: ‘Joe, is that you shooting down there?’ Then I thought sure hell had broken loose. Bullets from machine guns just naturally rained all around. ‘Come on, we’ll clean out these nests,’ shouted the Colonel, and I followed him up the hill. The Colonel was sore and couldn’t understand why our boys couldn’t break up those nests. Then he saw the tanks were not moving and sent me to see Captain English [who would later be killed] . . . to find out the cause. The tanks were stuck in the mud. The Colonel ordered me to follow him and when he reached the tanks, almost hub deep in the mud, he grabbed a shovel and began digging the tanks free. Other men and I also got busy digging. The Germans were sending across a heavy artillery fire, but finally we got the tanks moving and took them over the hill. The Colonel here found some infantrymen who did not know what to do, as their officers had been killed. The Colonel instructed me to place them with the tank detachment. Later the Colonel told me to get around to the side and wipe out the machine gun nests. ‘Take fifteen men with you,’ he ordered. ‘I’m sorry,’ I told him, ‘but they have all been killed.’ ‘My God! They are not all gone?’ the Colonel cried. When I told him the infantrymen had been killed by machine guns he ordered me to accompany him, declaring he would clear them out. I thought the Colonel had gone mad, and grabbed him. He grabbed me by the hair and shook me to my senses. Then I followed him. We went about thirty yards and the Colonel fell with a bullet in his thigh. I assisted the Colonel into a shell hole, bandaged his wounds and took observations of our surroundings. Shells flew all about us. Two hours later the Colonel revived and ordered me to go to Major [Sereno] Brett and instruct him to assume command of the tank corps [sic—304th Brigade]. I found him and did so. Then [I] reported back to the Colonel. A few moments later the Colonel, with three tanks, one French and two American, camped about twenty yards from the shell hole. ‘Jump out there,’ the Colonel ordered, ‘and scatter those tanks or they will be blown up.’ I rushed out, gave the order and came back again. The American tanks got away, but the French tank was shot to pieces and the men killed. The colonel then ordered me to get out on top of our shell hole and prevent any oncoming tanks from getting below us, the fire from the enemy being terribly heavy. Then the Colonel said, ‘Joe, the Germans have been making this shell hole a living hell since you left. Get a tank and wipe out those nests.’ This was done and after that I found four infantrymen who carried the Colonel to the rear." 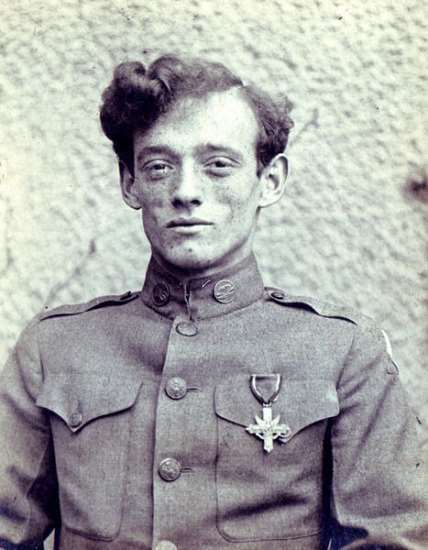 The President of the United States of America, authorized by Act of Congress, July 9, 1918, takes pleasure in presenting the Distinguished Service Cross to Private First Class Joseph T. Angelo (ASN: 243496), United States Army, for extraordinary heroism in action while serving with Headquarters Company, 1st Brigade, Tank Corps, A.E.F., near Cheppy, France, 26 September 1918. Within 40 meters of the German machine guns, Private Angelo carried his wounded commanding officer into a shell hole and remained with him under continuous shell fire for over an hour, except when he twice carried orders to passing tanks. Joseph T. Angelo returned to New Jersey after being discharged from the Army. By the end of 1919 he was boarding at 112 North 30th Street, the home of Mrs. Emma J. Kellum, a widow. He soon moved to 1016 South 5th Street, and found work in one of Camden's shipyards. He was listed at that address in the 1920 and 1921 City Directories. 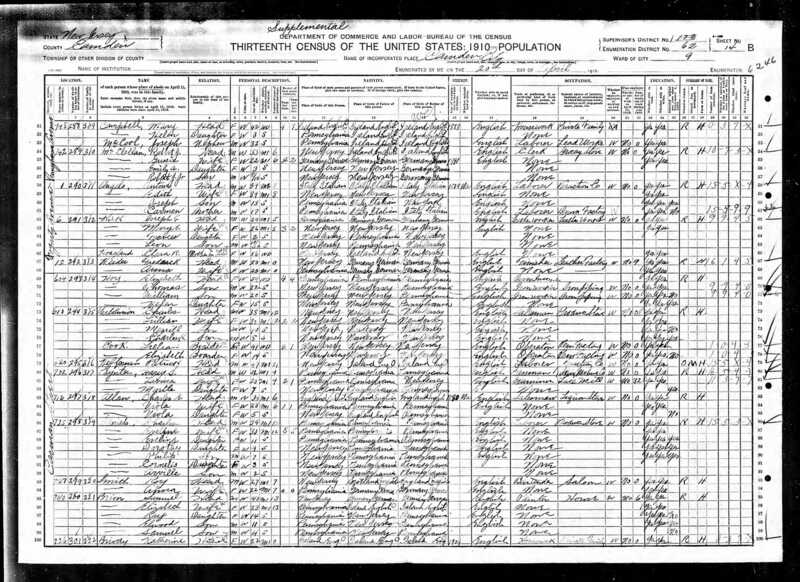 Shortly after the 1921 Directory was compiled, Joseph T. Angelo married. He and wife Sarah are listed in the 1923 and 1924 City Directories at 2415 Sherman Avenue in Cramer Hill. A daughter, Betty, was born around 1924. 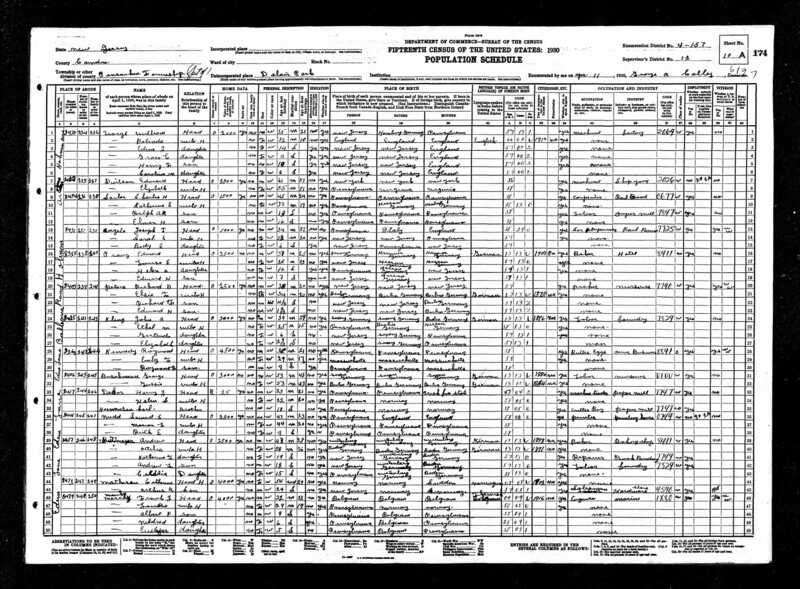 Joseph T. Angelo does not appear in Camden City Directories after this point, apparently having moved to the 8431 Holman Avenue in the Delair section of Pennsauken, New Jersey, where he lived out his years. In 1932, while Patton continued his path on his famous military career, Joe Angelo had returned to civilian life. He was unemployed and suffering along with many other veterans from the effects of the Great Depression. As a result, he joined the Bonus Army movement. The Bonus Army was a movement of First World War veterans demanding monetary compensation for their roles in the war. The particular issue was that these veterans had been promised compensation but they were not due to receive it until 1945. Given the realities of the depression, the veterans such as Joe Angelo demanded that they receive the money immediately. The veterans marched on Washington D.C., setting up camps in order to protest against the administration of President Herbert Hoover. On July 28, 1932, troops were ordered into the camps to quell the protest. In the resulting melee, two veterans were killed and many were injured. The commander of the operation was Army Chief of Staff General Douglas MacArthur. Dwight D. Eisenhower and George Patton, the man whom Joe Angelo had saved so many years before, were there in subordinate roles. In the aftermath of the assault on the camps, Angelo approached Patton, but was harshly rejected. The last known words between the men were uttered by Patton: "I do not know this man. Take him away and under no circumstances permit him to return." After this he explained to his fellow officers that Angelo had "dragged me from a shell hole under fire. I got him a decoration for it. Since the war, my mother and I have more than supported him. We have given him money. We have set him up in business several times. Can you imagine the headlines if the papers got word of our meeting here this morning. Of course, we'll take care of him anyway." Patton is often criticized for his treatment of Angelo on that day by leftists and those with an anti-military and anti-American bias, who conveniently leave out Patton's words to his fellow officers after having Angelo led away. Given the circumstances, however, there was little else that Patton could have done at the time. 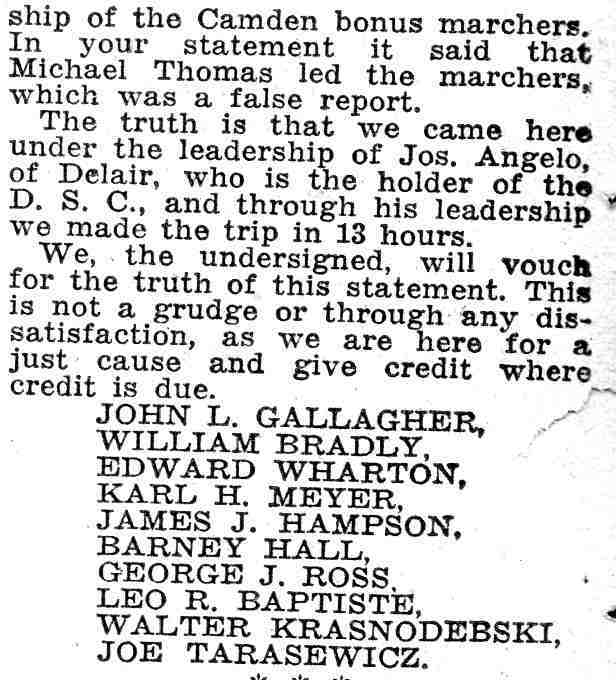 After the breakup of the Bonus Army, Joseph T. Angelo returned to his family in Pennsauken. 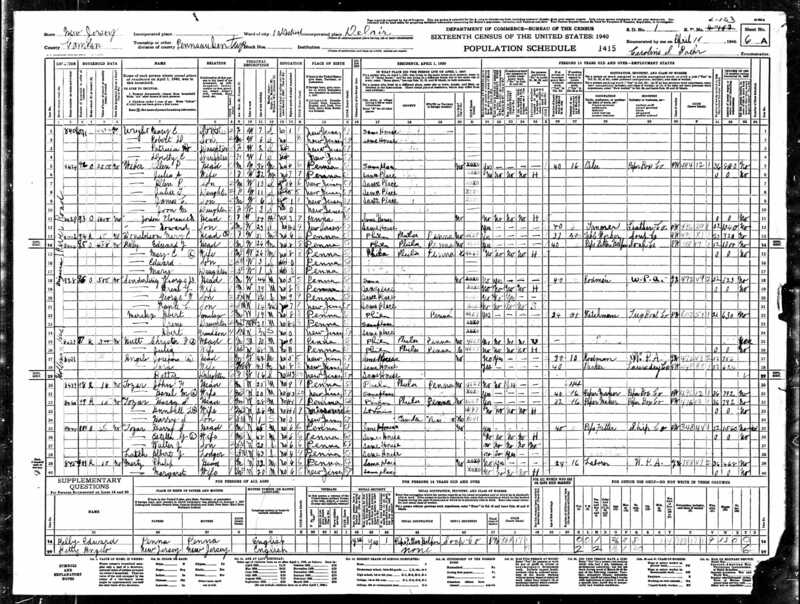 When the census was taken in 1940 he was working as a rodman with a W.P.A. road crew. 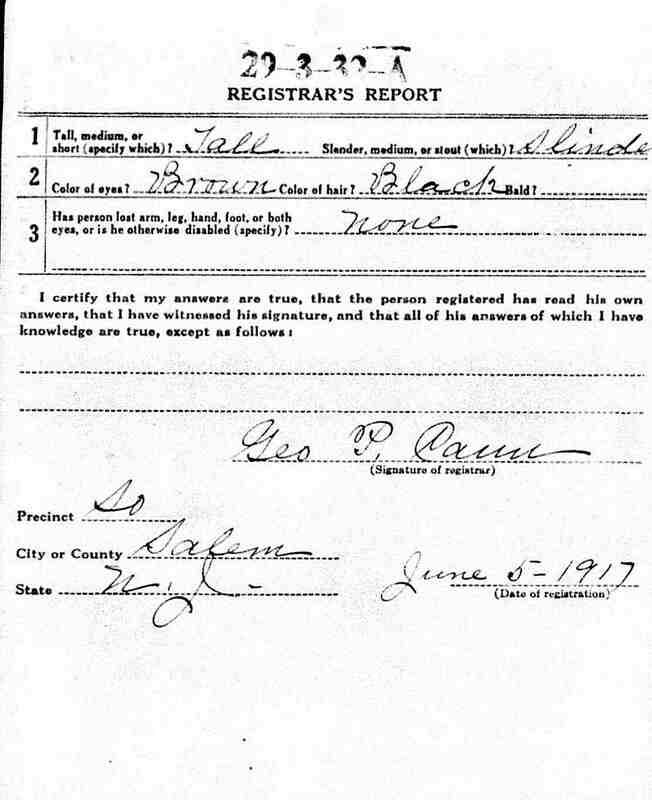 He attempted to re-enlist in the Army after Pearl Harbor but was rejected due to his age. He did register for the draft in the spring of 1942, as all men aged 46 to 65 were required to do at that time as a precautionary move. None, however were called to service. December of 1945 saw one of life's great coincidences, when the staff car in which General George S. Patton Jr. was hit by a truck driven by Technician 5th Class Robert Thompson, of Camden, New Jersey. Patton, who reportedly suffered a broken neck in the incident, was taken to an Army hospital 20 miles away and was on the road to recovery and plamming to return to the United States when he suddenly died on December 28, 1945. The reported cause of death was pulmonary edema and congestive heart failure. Joseph T. Angelo and family stayed in Pennsauken at the Holman Avenue address for many years. He was still a Pennsauken resident at the time of his passing in July of 1978.